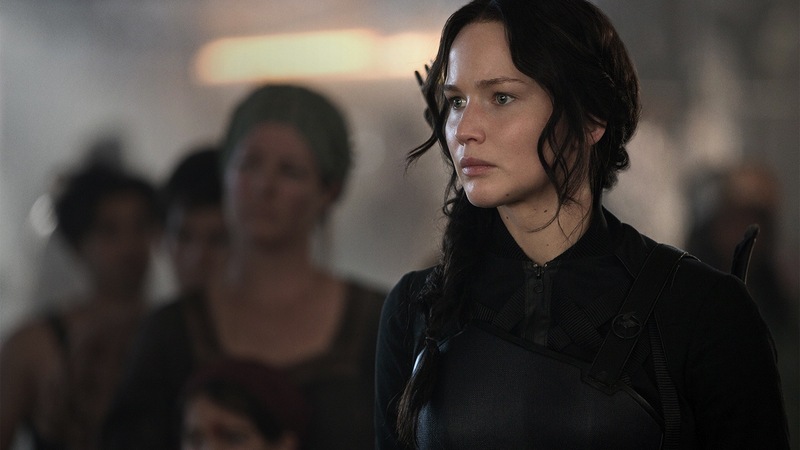 The Hunger Games: Mockingjay – Part 1 is essentially all foreplay. It's the first act of a larger story and serves, as the title would suggest, like half a film, albeit a fairly good one. Jennifer Lawrence returns as the titular symbol of a hope, Katniss Everdeen, and this time around, frames the Suzanne Collins young adult saga as objects of war propaganda, further exploring the military complex in its political themes. Director Francis Lawrence takes us completely out of our known environments and all the world-building of the first two films. We go underground with Katniss to the rebellion of District 13. There are no actual games in the film as director Lawrence goes deep into the mindset of all out war. Gone are any references to childhood or youth, adding a new dynamic and feel to the franchise. Mockingkay explores behind the scenes political machinations and how rebellions are orchestrated and manipulated. Written by Danny Strong and Peter Craig, we're stripped of both the hard realities of the districts and the oppulent decor of the Capitol, as the writers adapt the small-scale drama of emotions through war and politics. Part 1 is grim and bleak, taking place mostly indoors or around destruction, as many of our characters interact through back and forth through video message of propaganda, looking to motivate the masses. There's a lot of time and freedom to explore subtle characters moments and dystopic life. This could easily drag and feel unsatisfying without a proper resolution or arc yet director Lawrence wisely constructs the film around performances. Katniss continues to be a fascinating subject and stand in of the audience. She's an image of manufactured appeal based on real elements of her actual personality used and constructed a tool and device to manipulate her followers and promote war/violence. It's true very little happens in the film as it chases small endeavours and preparation for war. This allows the ridiculously talented cast to play. The late Philip Seymour Hoffman in particular really adds to the stark tone of the picture in a role easily used purely for exposition played by any other actor. Hoffman becomes a de facto media manager who crafts Katniss' image to motivate the districts against the Capitol and build the resistance. We see further developments as many of our familiar faces are outside of the Capitol, particularly Elizabeth Banks as a stripped down Effie Trinket and a sober Haymitch (Woody Harrelson), who are essential to tempering Katniss' fiery personality. Series newcomer Julianne Moore is delightfully stoic and demure as District 13 President Alma Coin, running the underground resistance, as is Cressida (Natalie Dormer), a key member of the military effort. Donald Sutherland is even more effective as the comically evil baddie through distance ping-ponging with Katniss. Josh Hutcherson's Peeta is cast aside, mostly unseen in the Capitol and used as a pawn of propaganda by Snow to hurt Katniss from afar. Gale (Liam Hemsworth) steps in and guides Katniss through her grief, escaping the romantic triangle setup with Peeta temporarily out of the picture. Mockingjay – Part 1 is as good as half a film can be. It sets everything up fluidly as a claustrophobic, insular introduction for the assured all-out war expected to come in Part 2. Lawrence's performance continues to anchor the entire dystopic universe. Director Lawrence really has a hold on the material, bringing a gripping urgency and compelling tone, handling small character moments and performances gracefully.